We have a new lyra teacher on Tuesday evenings, and she’s lovely and gives a great class — but I’ve decided that I’m going to bow out of that class, because Ballet. Basically, there’s too much in that class that trains the muscles I’m trying to de-train a bit (hello, quads; greetings, hip abductors), and the result is that Wednesday morning is a struggle to counteract those effects, which means it’s a less-effective class than it should be (qv: today my left split was laaaaame and my turnout was, by my standard, only meh). Wednesday is legitimately the hardest class in my week, much of the time, and I want to be fully able to take advantage of it. Once upon a time, I used to ride my bike a lot more. I cut back on that for similar reasons — I am constitutionally unable to refrain from stomping up hills, destroying my turnout all the way, so I simply ride less. Dancing has made it easier to decide what to do and what not to do. It feels akin to religious conviction: when conviction is very strong, the decision to live by the tenets of one’s faith is not as difficult as it might otherwise be. 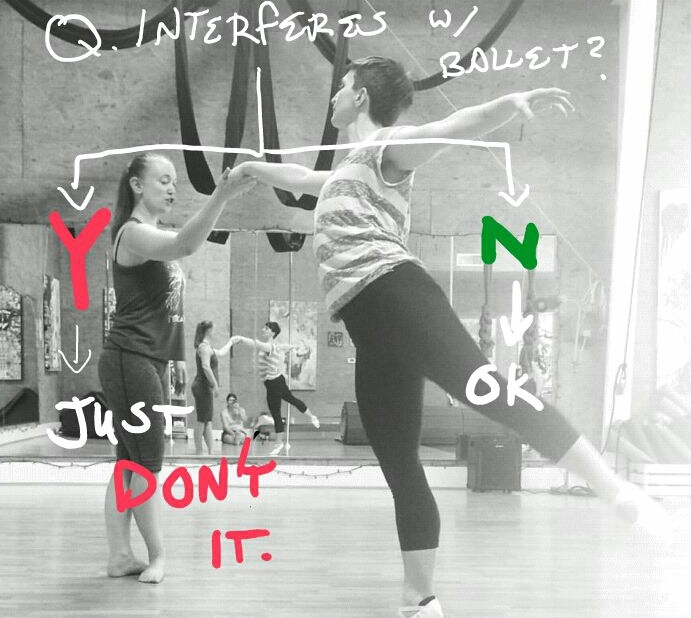 So this is weird, in that now and then I realize I’m sacrificing things on the altar of ballet — but also not weird, in that deciding what to do and what not to do has never been simpler. Basically, this flowchart governs my entire life (photo by Amy Merrick). I kind of wish I’d figured this out as a kid. So much of my life has been needlessly complicated. On the other hand, I had some amazing experiences, and it’s really awesome to have all these other interests in my pocket in case I ever mysteriously tire of dancing. Class this morning was also complicated by the fact that mold-and-ragweed season has descended upon us, bringing with it asthma and pleural pain. I had to take my inhaler before class this morning, so things were harder than they should have been. I’m still having issues, so I’m taking the night off. Basically, taking the inhaler before class is rather like taking a nice hit of cocaïne before running wind sprints, only cocaïne is better at turning off the Governor in your brain that makes you slow down before your heart explodes. Basically, you tell your body, “Okay, fondu now, and DO IT RIGHT,” and the governor sticks its fingers in your body’s ears and says, “Don’t listen to him; he’s a putz,” and your body is is like AAAAUGHHH DON’T KNOW WHAT TO DO and half-arses its way through everything. I finally started to assemble my proverbial waterfowls in a linear array during the adage at centre (because by then the initial kick-in-pants offered by the inhaler was wearing off). Ironically, perhaps, I did better in petit allegro than in just about anything else, though I had to think entirely too hard about the entrechat trois for some reason at first (possibly because we generally do cinq?). It was still rather an uphill struggle, though. Tomorrow night, I plan to do BW’s class, after which will be heading out for Marco Island early Friday morning. I’m ambivalent about the trip — I know I’ll enjoy it, but I’m not in love with the idea of taking off again just as I’m getting back into the swing of things. On the other hand, this trip should be a lot more relaxing, and when I come back my life is is like SwanLakePilibolusShowPilobolusClassWendyWhelanTalkMovingCollectiveNutcrackerWinterShowcase, and that’s just the part that isn’t ballet and modern classes. I’ve also involved myself in the parents’ and adult students’ group at the ballet school, which is pretty exciting. BB and I have sort of become the de facto adult program delegates, which is no big surprise, since we’re basically always at the school anyway. Anyway, I think that when I come back from Florida, I’m going to switch to Flexibility & Mobility on Tuesday nights. In other news, I cheated on my favorite shoes by wearing my white stretch canvas ones, and I’m forced to admit that I quite like them. Too soon for a full review, though. Posted on 2016/09/28, in adulting, balllet, class notes, health, kit, life and tagged finding your focus, personal razors, priorities. Bookmark the permalink. Leave a comment.